Photograph depicting a Christmas float decorated with a Christmas tree in the 1966 Andrews, North Carolina Christmas Parade. Photograph of a Christmas float decorated in a Christmas toy theme, taken in 1966. Photograph of a Christmas float in a 1966 parade, children laying in a bed with stockings hung for Santa Claus in Andrews, North Carolina. 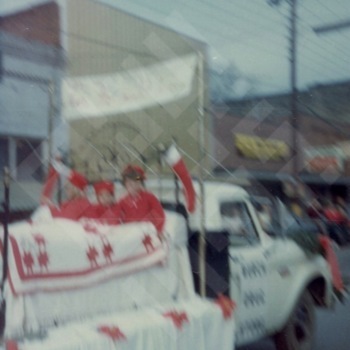 Photograph depicting a Nativity Scene Christmas float in the 1966 Andrews, North Carolina Christmas parade. Photograph of Santa Claus in front of the Jabaley Department Store in a decorated convertible for the 1966 Christmas parade in Andrews, North Carolina. Photo of the display of the American flag in front of the Jabaley Department Store during a 1966 Christmas parade in Andrews, North Carolina. Woman riding on a corvette during a 1966 Christmas Parade in front of Jabaley's Department Store in Andrews, North Carolina. Caption from Marsha El-Khouri Shiver: "4th of July Parade Float, Daddy, George, Marsha, Barbara, Theresa, & Mariam"
The Jabaley Department Store float in the Andrews Fourth of July parade, with two of the El-Khouri girls visible on the float and unidentified citizens in the background.